Despite being born in Africa, Danny Williams grew up and started his singing career in England. He remained a fairly little known singer until recording his superlative rendition of 'Moon River'. The song has since, somewhat confusingly, become more associated with American Andy Williams, but it was Danny Williams that produced the version normally regarded in the UK as 'definitive'. Apart from this superb single, Williams managed the chart with several other MOR ballads, the most memorable of which was 'Wonderful World Of The Young'. None of his successful UK hits made any impression in the USA, however he managed to reach the US #9 with a song called 'White On White' in 1964; a record which, perversely, flopped on his home ground. By the mid-1960s he was beginning to struggle to find suitable material and was never able to get near to repeating his previous successes. However, his biggest hit single was great enough to sustain his long term career which he carried out mostly by touring on the UK night club circuit. The EP shown here on the left was the first on that format to be released for this young singer. Despite its title it does not contain the legendary "Moon River", but just sides from two hits that followed it plus a song that didn't appear on a single at all! John C. Gee's sleeve notes refer to the advent of Danny Williams as a promise for a brighter future- doubtless he saw Danny as many did as a kind of UK version of Johnny Mathis. In retrospect the brighter new future arguably belonged to the, yet unheard, beat groups; nevertheless Danny Williams had already secured his long term singing career and would outlast most of them. 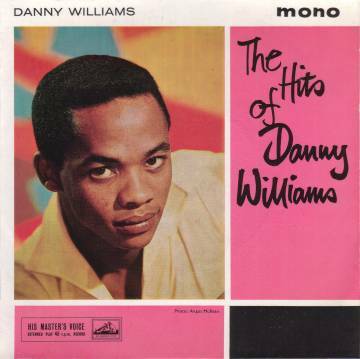 Although without a chart hit for several years, Danny Williams continued issuing singles from time to time long after his most successful period in the 1960s had waned. He was rewarded for this tenacity, when in 1977 he reached #30 with a song called 'Dancing Easy' which was based on a jingle from a TV commercial. Danny continued to sing and make recordings right up to his untimely demise. Sadly, this wonderful singer died from cancer on December 6th, 2005. HMV 7EG78748 1962 "The Hits Of Danny Williams"
HMV 7EG8763 1962 "Danny Williams Swings With Tony Osborne"
HMV 7EG8800 1963 "The Days Of Wine And Roses" w. Alyn Ainsworth Orch. The Days Of Wine And Roses(w.Geoff Love Orch. )/My Own True Love/The Greatest Love/"To Each His Own"